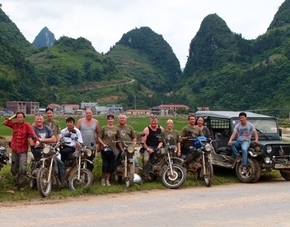 I would like to thank you for organising our ride through the north of Vietnam and for getting us through the tour all safe and in one piece. What a great experience it was for us. The country has amazing views no matter where you look from. As a female on the trip, it couldn’t have been better. The riding was great for the times we were on the bikes. The two drivers Han and Lap were fantastic. They were very accommodating to all us girls, whether is was stopping for photos or taking us to a spot just to look at the views. There was never a dull moment on the trip. This has been a very well worth trip to do in your country and we highly recommend it to any one. We have some great photos for our memories.